buyvpc has no other items for sale. Sales tax may apply when shipping to: AL(11.0%), CA(10.25%), CO*(11.2%), CT(6.35%), FL*(8.0%), GA*(5.5%), IL*(11.0%), IN*(7.0%), IA*, KY*(6.0%), LA(12.0%), ME(5.5%), MD(6.0%), MA(6.25%), MI*(6.0%), MN*, MS*(8.0%), MO(10.1%), NC*(7.5%), ND*(8.5%), OH*(8.0%), OK(11.5%), PA*(8.0%), RI*(7.0%), TN*(9.75%), TX*(8.25%), WA*, WI*(5.6%). The good news is it works fine. I got a huge HD monitor and decided to use it between my home PC and work PC when i am off hours. Iw worked fine. The bad news is it only came with two sets of cable even though it is a 4 port switch. I only needed two so it was not a biggy for me but might be for someone who wants to hookup to four systems. The cable i did receive were very high quality and you can never go wrong with this manufacturer. I plugged in a couple of different wireless mice into the port on the back and they did not work. I had to plug the receiver directly into the pc which completely defeats the purpose of using this switch. I also tried plugging the mouse receiver into the USB port of the keyboard I had attached to the switch. Again, this did not work. 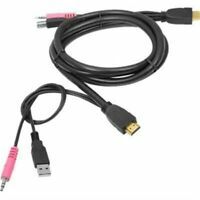 Secondly, while the unit does come with two sets of cables, the cables are very bulky because they combined the USB and microphone cable in with the HDMI. This means that if you want to place the switch into a somewhat tight space or on your desk, be prepared for a lot of bulky cables that are heavy enough to tip the switch over when the cables turn down behind your desk or whatever cable chase is being the switch. Lastly, the switch comes with an infrared remote which will picks up certain codes from my LG monitor remote. So, when I turn the volume up on my display, it turns off the switch and disables the keyboard and mouse. I had to put a piece of black tape over the switch's IR port. Not a big deal unless you plan on mounting the switch in such a way as to need the remote to flip between displays (like maybe in a bar or restaurant). Not a bad deal for the money considering that you get a few cables but there are some drawbacks. The wireless mouse failure is the real deal-breaker for me. I had to go back to a corded mouse.